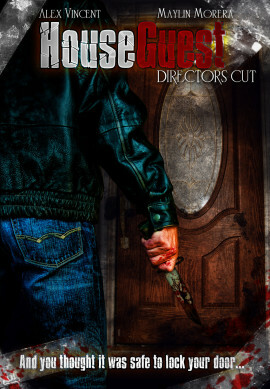 Before I get started, I would like to officially thank the producer and director of “House Guest” Brian and Jake Jalbert, for allowing me to watch the online screener for the film. House Guest is about a brother and sister who invite some of their friends over one night for a card game and some drinks. A vicious killer is on the loose having already killed several people and escaped authorities. The group are told to stay inside until he is apprehended. Soon after, they have a particularly interesting guest knock on their door and all hell breaks loose. The film stars Brian Jalbert, Nick Canning, Danielle Marcucci, Alex Vincent, Randall Speakman and the lovely and beautiful Maylin Morera. I can normally spot familiar faces in independent films like this but I didn’t know anyone here. The films synopsis is much like plenty of other films. It had a bit of “The Perfect Host” about it, along with several other home invasion style flicks. I believe the estimated budget for the film is around $100,000. For that kind of money Jake and Brian got a good-looking product. The film has really solid audio and some really cool choices for the soundtrack, most noticeable was the opening piece of music. There is some fantastic smooth camera work and nice panning up and down and side to side in several of the shots. I thought some of the editing in scenes was a little abrupt though, but it wasn’t too bad. Keep in mind, this is a first time feature from the brothers. The acting is okay nothing great but it’s about what I expected. There were several really disappointing aspects about House Guest. It’s a real shame too because the guys got all the technical aspects right and used their budget wisely. I thought the opening scene was a little bit lame. I think the audience could have just been told there was a killer on the loose and not even shot an introductory scene to that, it may have given off more tension. I thought the score throughout the film was really cheesy, it had a game show type of vibe to it. The films two weakest points would be the action sequences and the character backgrounds and motivations. We never get an official introduction to anyone in the story, How do they know each other?, Did they have plans for any particular reason? The only connection we have is Jen and Rob Murphy who we know are brother and sister. The others probably weren’t important enough but I still think they needed some sort of development, especially the killer. I think the brothers also made an error with the trailer for the film. It gives far too much away about the details of the killer and the invasion, that it dampens any chance of twists and turns in the story. It left the film fairly plain and predictable. Moreover, the suspense is non-existent. When you write a “killer” character with no real menace or screen presence it’s a slap in the face to the audience. I didn’t love Speakman in the role, he was okay but never really sold me on the fact that he was serious about what he was doing. His character was written as one-dimensional and therefore won’t command much respect from the viewer. The reactions from our young group prove he wasn’t very menacing at all. They don’t run, they don’t scream and they don’t fight back. There is a little bit of crying but that is about the extent of it. So I’m not sure who he was supposed to be scaring. I was hoping the film would make up for the underwhelming killer by having some good blood and gore effects or action. Sadly, neither of my expectations were met. The sound effects used in the “stomping” scene had timing issues and sounded really fake, like cartoon violence. There was only a small amount of blood and it didn’t really suit the kills that took place. I was hoping for a little more with House Guest. I know it’s a relatively small budget, but I thought the action sequences and effects could have been done much better. I like the fact they didn’t resort to cheap CGI though. It’s a short running time of only 71 minutes, it’s technically well made and there are a few sequences worth watching. Maylin is a stunner, so it was nice to watch her get a good amount of screen time. I commend Jake and Brian on their first attempt at a feature film. Once again, I really appreciate the opportunity to view the film. I am interested to see what the guys do for their next film, there is always room for improvement. If you have a spare hour to kill check it out.